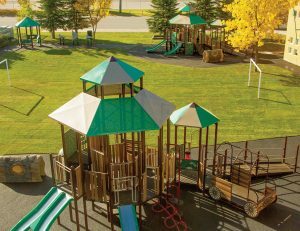 Renfrew Educational Services—a leader programs for children with special needs—requested a complete playscape featuring nature-inspired play structures along with sensory experiences, a quiet area and sport activities, all connected via accessible pathways. Opportunities for inclusive and parallel play were paramount as were a need for shade and shelter. Our design team responded with a captivating tree-house design where all abilities can play together. Wood-look slats create a woodsy, fort-like setting. Stunning pagoda roof panels provide aesthetic appeal as well as shade. Ramps connected to hex decks and ground level components supply a myriad of opportunities for accessible and inclusive play. Two large play structures help separate and spread out the play for easier supervision and added safety. Each structure was carefully designed to target a specific age group, providing varying levels of challenge. Freestanding realistic log features constructed of rugged GFRC provide clambering fun while enhancing the natural feel. Outdoor musical instruments offer accessible sensory play. A well-placed gazebo complete with seats and play panels offers a place for quiet time. Finally, pour-in-place surfacing and a pathway connecting the various pieces create a complete playscape. Outdoor musical instruments foster sensory play as well as a sense of pride. Being out on the playground is just so much fun! Freestanding realistic log features constructed of rugged GFRC provide clambering fun while enhancing the natural feel. Accessible rings are installed at a lower height for easy access to upper body fun. Accessible fire engine provides imaginative play for all abilities. Children create connections on the playground.